First things first, Napoli’s had some injury woes this season that have undoubtedly led to his meh numbers. He dislocated a finger on his left hand in mid-April; he never went on the DL, but still…that’s a rough injury to play through if you’re having to swing a bat. And then, on May 24, he sprained his right ring finger, which cost him a trip to the DL. Perhaps some fingers are worse than others – Napoli’s teammate, Dustin Pedroia, hasn’t been the same since his thumb injury, even though his power may have already been in decline – but either way, it’s not hard to make a case that injuries have hurt Napoli a little this season, from a playing time perspective, at the very least. 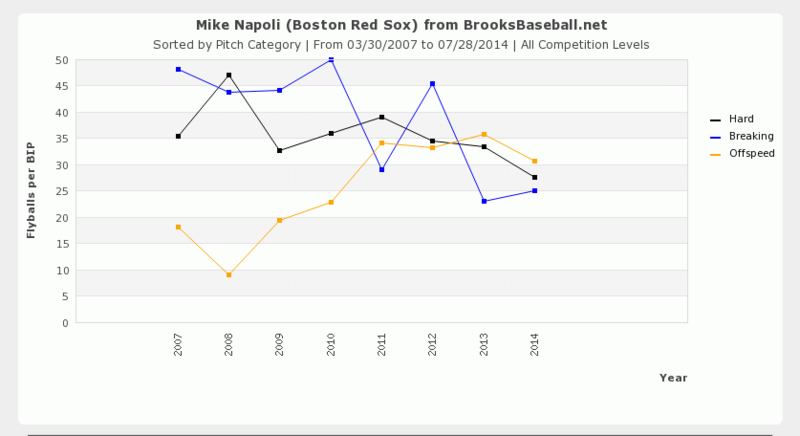 Also of concern: Napoli’s flyball rate. Napoli’s hitting fewer flyballs than he ever has – only managing to hit flyballs on 36% of the balls he puts in play, a large drop-off from his career average of 43%. It makes sense intuitively: fewer flyballs, fewer home runs. As you can see, Napoli isn’t in the midst of simply struggling with hitting one type of pitch in the air – his FB rate on each category is down. I most alarmed by his FB rate on hard pitches, though, because throughout his career Napoli has made his name by punishing fastballs. And, lastly, his HR/FB rate is down as well. So, fewer flyballs than usual and the flyballs that are hit aren’t leaving the park as often. Thankfully, the bad news stops there. Only three players have a longer average distance on flyballs than Napoli: Paul Goldschmidt, Juan Francisco, and Jose Abreu. Napoli is hitting fewer flyballs, but the ones he is hitting are travelling a very long way, on average – roughly 15 feet farther than they did last year, in fact. His flyball distance isn’t the only the good sign; his strikeout rate is lower than it’s been in years, sitting at a manageable 26%. And his walk rate is nearly the best of his career. He’s gotten to this point by swinging less than he ever has, but also making more contact than ever before, inside the zone and outside of it. There’s a fine line to be walked on making contact on bad pitches, because usually that contact doesn’t amount to much. On the whole, though, both of these things are good. Napoli’s still doing what’s made him successful: not chasing pitches; only now he’s not whiffing as much. It’s hard to get to up in arms about that. Admittedly, it feels strange to write a post about someone with a 136 wRC+ and begin the piece that they’ve been a disappointment, but here we are. Napoli’s fine. He’s being patient. And, per his MO, he’s hitting fastballs well, although not quite as well as he has in the past; he’s posted a .211 ISO versus two-seam and four-seam offerings this year, compared with .285 last year and .231 in 2012. It’s hard to imagine his time out of the lineup combined with his finger injuries haven’t stunted his production on fastballs. He is seeing more pitches qualified as hard by Brooks Baseball, so pitchers have taken notice. Now it’s up to Napoli to adjust during the next two months. Napoli hasn’t been what I hoped for (I own him on three teams), but a solid second half could cure mostly everything. There are some not so good signs and some good ones. Fortunately, I believe the good signs, along with some positive regression, will win out, and his success at the plate will translate a little better into roto production going forward. Power outages can be iffy; a handful of swings can change a player’s entire outlook. Luckily, Napoli’s swings are producing some of the deepest flyballs in Jeff Zimmermann and Bill Petti’s database. It might be tough to pry Napoli away from someone after homering in back-to-back games last week, but if he can be had, go get him. He should have a solid second half, even if his batted ball profile doesn’t revert to its norm. If it does revert a little, though, he could be in for a monster stretch run. If anything, just staying on the field should get him around 20 home runs, according to ZiPS and Steamer. Is it really difficult to see him hitting a couple more than that if things break right? We hoped you liked reading Mike Napoli’s Alright, Isn’t He? by Landon Jones! Caveat:………with the Saux out of the race, vets like Napoli will be sitting more and more as September rolls along, allowing the younger players and callups to play. Buyer beware! The Sox don’t really have any young players who would be taking playing time away from Napoli. The only 1Bman on the roster is Mike Carp, who’s demanded a trade. Plus, Napoli’s under contract for next season. I guess if they don’t clear up their left side of the infield logjam (Bogaerts, Drew, Middlebrooks, Holt, and a pile of prospects), and everyone is healthy at the same time, they might try giving Middlebrooks time at 1B.